There's a few things about this album that I really like. I'll always be partial to gruff vocals like this. They have a sort of lived in quality that reminds me a bit of Eric Bachmann from Archers of Loaf. Those gruff vocals are really the only similarity to Archers on this record. I also really enjoy the saxophone. It's used very much in a Circa: Now sort of foghorn blast. But again, for me, the Rocket From The Crypt comparisons end there. More than anything, this reminds me of the sort of somber, midwest rock that was prevalent the late 90's and early 2000's. I immediately start thinking of bands like Sweep The Leg Johnny or Karate or Dianogah. Basically, I could really see this as the sort of thing Southern records would have put out. It's a mixed bag for me because although I never had anything against those bands and thought they were all fine, I never bought any of their records. There's just a bass fueled darkness that surrounds records like this. While I can appreciate the craft and respect the musicianship, it's never been the sort of thing I wanted to spend much time listening to. 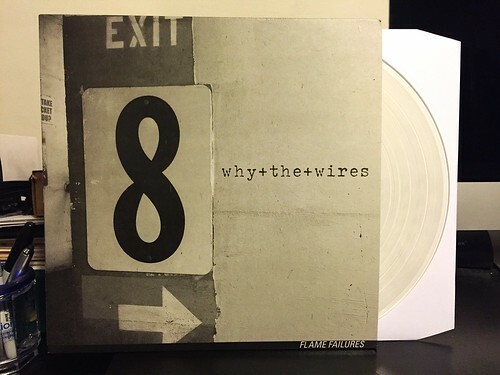 So, if that's the sort of thing you can get behind, absolutely give Why+The-Wires a chance. But if you're looking for something upbeat and hooky, this probably isn't going to scratch that itch.